Here is Bank Road at the very beginning of the twentieth century. It is a relatively quiet scene, taken from just above the point where Bank Road is at its widest. A tram can be seen at the bottom of the slope and there are a few people walking up or down the hill in addition to the two on the cycle on the left. Published when Edward VII was on the throne, the postcard dates from between 1901 (when Edward ascended the throne) and 1905. A pointer on the card is that the Wesleyan Methodist Chapel does not have a steeple and one was not added to the church until 1905. On the right is Yew Tree House, which was a butchers. In 1903, so around the time this picture was taken, "one of the most important sales of freehold property held recently in the Matlock district" took place at the Crown Hotel. The house had been owned by Job Knowles and the trustees of his estate decided to sell it, together with some other land nearby. The sale was in two parts, the first of which was the "stone-built dwelling with butcher's shop attached known "Yew Tree House" on Bank Road, Matlock, with gardens, etc.". Yew Tree House was bought by Mr. Job Smith for £1600, on behalf of Smedley's Hydro Company whose property adjoined it on one side. The second lot was building land abutting on New Street; it was then in the occupation Mr James Wheeldon and was purchased by Mr. Henry Ball of Nottingham for £635. Yew Tree House continued as a butchers for many years. Smedley's first tenant could have been Charles Everett Taylor, a butcher and farmer. It is not clear quite when he took up residence, but was living there between 1908 and 1912 with his wife Alice and young children. The X on the picture next to the clump of trees on the top of Masson was where the card's sender, Georges Houstier, had been to enjoy the view. "Une vue magnifique". 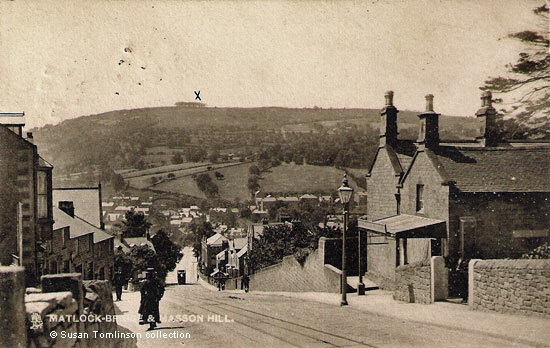 "Matlock Bridge & Masson Hill". Postcard published by Raphael Tuck & Sons. O'er Hill & Dale Post Card. Art Publishers to their Majesties the King and Queen. 2250 Matlock Bath & Matlock Bridge. Posted 12 Jul 1908 and sent to Romans, France. "Derbyshire Times and Chesterfield Herald", 1 August 1903. Yew Tree House and its gardens covered 2a. 2r. 4p. of land. The second plot that abutted on to New Street was 1a. 2r. 4p. in size. Matlock, Riber & Starkholmes Newspaper Cuttings, 1903 has the full report. Presumably Charles Taylor rented or leased the property from Smedley's. He was living on Smedley Street in the 1901 census. He advertised in Kelly's Directory, 1908 and Kelly's Directory, 1912, when he was living at Yew Tree House.